The Charisma Myth (2013) defies the popular notion that charisma is inherited, arguing instead that everyone can cultivate their own charisma, and in doing so can have a more positive attitude, find more success, and handle obstacles more successfully. Using wide-ranging examples of charismatic people, from state leaders to CEOs to employees, the book also outlines the different styles of charisma and how to practice demonstrating each, and offers some useful tools and exercises with which to improve their psychological well-being. Debunking the charisma myth: it's not inherited but a set of behaviors which anyone can learn. 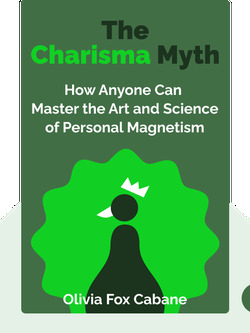 Despite the popular charisma myth, people aren't born with charisma – no matter how naturally magnetic some people appear. If such people were inherently charismatic, then without fail they would always be captivating. But no one is charismatic around the clock. Someone might be utterly captivating one day, and the next be totally boring. This is because charisma is not some kind of magical aura but the result of a person displaying certain behaviors. These behaviors are nonverbal – they are body language. In any given moment, if we appear charismatic, it's because our body language is expressing charisma. For that reason, our charisma levels fluctuate: a single person will sometimes be perceived as charismatic and other times not. For example, consider the famously charismatic Marilyn Monroe, who was able to switch at will between her “Marilyn” and “Norma Jean” personas. On one occasion, “Norma Jean” managed to ride the subway without passengers noticing her. The moment she reemerged on the New York streets, she transformed herself into “Marilyn.” How? Simply by changing her body language: adjusting her hairstyle and striking a pose. All eyes were immediately on her. Why, then, is the charisma myth so popular? The reason is that we experience only the effect of a charismatic person. What we don't see is the time and effort such people put into learning charismatic behavior. Many famously charismatic people worked hard to learn this behavior, until it eventually became instinctive. One such person was Steve Jobs, who, early on, appeared very awkward during presentations. Over the years, he managed to gradually increase his charisma, eventually becoming the Steve Jobs we admire: the man who kept audiences hanging on his every word. As you can see, everyone can be charismatic, simply by learning, practicing and refining the appropriate behaviors. Next, we'll look at those behaviors in detail. The charisma myth: it's not inherited but a set of behaviors which anyone can learn. Charisma is, above all, body language – and this begins in your mind. Charisma requires presence – a skill that makes you stand out, but is hard to achieve. Charisma means being powerful and warm – being willing to use your power for others. There are several charisma styles; everyone has to find the right one for themselves. The most important part of being seen as charismatic is making the right first impression. Being charismatic means overcoming mental and physical discomfort. Dedramatize: what's happening isn't serious, and lots of others are going through it. Destigmatize and neutralize: negative thoughts are nothing to feel bad about, and they’re not necessarily real. Start your free Blinkist trial to get unlimited access to key ideas from The Charisma Myth and over 3,000 other nonfiction titles. With bitesize text and audio, it's easier than ever to find the right ideas to transform your life.